I received the Cosmo VoxBox and was immediately surprised to see the cool variety of things that were sent to me! I was really impressed that it wasn't just a couple of small things that were thrown in. 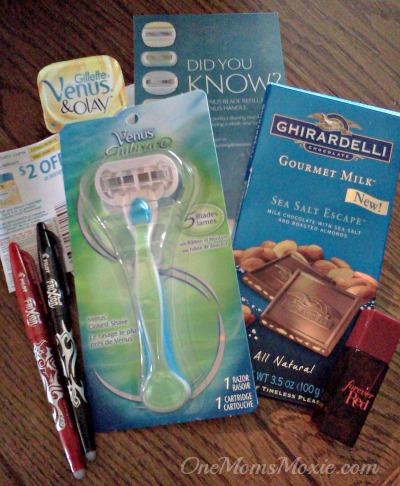 Here is what was included in my Cosmo VoxBox. I have to point out the Gillette Venus razor. Gillette has really outdone themselves, they made this razor so that any Venus refill blade will fit on this handle. No more purchasing a new razor set every time I want to switch the type of blade I want to use! I really love this and if that wasn't enough they also sent a $2 off coupon. My next favorite item are the Pilot Frixion Erasable Pens. Now I have to hide these pens because everyone loves them in my house. The Frixion is really erasable and the ink flows freely from the pen. I also received the Forever Red by Bath & Body Works. This perfume is sweet and the lovely scent lasts longer than most perfumes I have tried in the past. My daughters now like to use this before going to school, they have been told how good the perfume smells. The last item was the Ghirardelli Sea Salt Escape candy bar. This is a milk chocolate bar with sea salt and roasted almonds. I have to be honest it wasn't my favorite but my Mom the chocolate connoisseur of the house enjoyed it. I absolutely loved receiving the Cosmo VoxBox and look forward to reviewing many more if I am able to.